We describe a partial crocodilian skull from the Mesozoic non-marine sediments of the Khorat Plateau Sao Khua Formation (Berriasian-Barremian) in northeastern Thailand and assign it to Theriosuchus grandinaris sp. nov. An isolated dentary from the Phu Kradung Formation (latest Jurassic–Early Cretaceous) is also tentatively assigned to the genus Theriosuchus, and an isolated tooth from the Khok Kruat Formation (Aptian-Albian) may belong to this genus. The Thai fossils represent the first unambiguous evidence of presence of Theriosuchus outside Europe. Its occurrence in Thailand increases the known diversity of neosuchian crocodyliforms from Southeast Asia and suggests that Atoposauridae had a wide geographical distribution from the Late Jurassic to the Early Cretaceous. Beschrieben wird ein teilweise erhaltener Krokodilschädel aus den mesozoischen, nicht-marinen Sedimenten der Khorat Plateau Sao Khua Formation (Berriasian-Barremian) im Nordosten Thailands und zu Theriosuchus grandinaris sp. nov. gestellt. 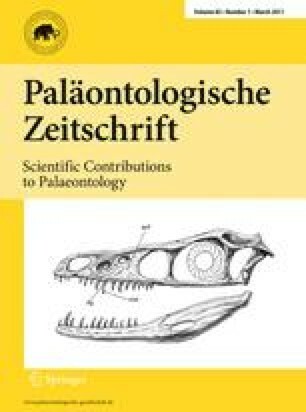 Ein einzelnes Dentale aus der Phu Kradung Formation (Spätes Jura—Frühe Kreide) wird ebenfalls unter Vorbehalt der Gattung Theriosuchus zugeschrieben und ein einzelner Zahn aus der Khok Kruat Formation (Aptian-Albian) könnte auch dieser Gattung angehören. Diese thailändischen Fossilien sind die ersten eindeutigen Beweise für das Vorkommen von Theriosuchus außerhalb Europas. Sein Auftreten in Thailand erhöht die bekannte Diversität von neosuchischen Krokodiliformen in Südostasien und deutet an, dass die Atoposauridae vom späten Jura bis zur frühen Kreide eine weite geografische Verbreitung hatten. We thank Daniela Schwarz-Wings and an anonymous reviewer for their helpful comments. We would like to warmly thank the people who helped us in the field: Uthumporn Deesri, Suchada Khamha, Jeremy Martin, Oranuch Cheychiw, Assadawut Sosanenoi, Ladda Sornsan, Nittaya Suna, Chalermchai Jittarat, Sakchai Juannagm, Wilailuck Naksri, Atiwat Watanapitaksakul, Songwut Uthensut and Kamonlak Wongko. We also thank Prof. Dr. Reon Samana for supporting our work at the Palaeontological Research and Education Centre (PRC). We truly thank Prachumporn Lauprasert, Nual-anong Narkkong, as well as all the staff at Sirindhorn Museum and PRC for their useful suggestions, comments and encouragement. Thank you to Jesper Milàn for German abstract. This work has been supported by TRF-CHE (MRG 5080410), the special programme for Biodiversity Research and Training Programme (BRT/BIOTEC/NSTDA) Grant BRT R_245007 and the National Research Council of Thailand (NRCT). G.C.’s work was funded by the Carlsberg Foundation.